As you’re no doubt aware, humans are a rather noisy species. Not just audibly, like in the case of somebody talking loudly when you’re in a movie theater, but also electromagnetically. All of our wireless transmissions since Marconi made his first spark gap broadcast in 1895 have radiated out into space, and anyone who’s got a sensitive enough ear pointed into our little corner of the Milky Way should have no trouble hearing us. Even if these extraterrestrial eavesdroppers wouldn’t be able to understand the content of our transmissions, the sheer volume of them would be enough to indicate that whatever is making all that noise on the third rock orbiting Sol can’t be a natural phenomena. In other words, one of the best ways to find intelligent life in the galaxy may just be to sit around and wait for them to hear us. Of course, there’s some pesky physics involved that makes it a bit more complicated. Signals radiate from the Earth at the speed of light, which is like a brisk walk in interstellar terms. Depending on where these hypothetical listeners are located, the delay between when we broadcast something and when they receive it can be immense. For example, any intelligent beings that might be listening in on us from the closest known star, Proxima Centauri, are only just now being utterly disappointed by the finale for “How I Met Your Mother“. Comparatively, “Dallas” fans from Zeta Reticuli are still on the edge of their seats waiting to find out who shot J.R. But rather than relying on our normal broadcasts to do the talking for us, a recent paper in The Astrophysical Journal makes the case that we should go one better. Written by James R. Clark and Kerri Cahoy, “Optical Detection of Lasers with Near-term Technology at Interstellar Distances” makes the case that we could use current or near-term laser technology to broadcast a highly directional beacon to potentially life-harboring star systems. What’s more, it even theorizes it would be possible to establish direct communications with an alien intelligence simply by modulating the beam. Jill Tarter: Searching for E.T. What must it be like to devote your life to answering a single simple but monumental question: Are we alone? Astronomer Jill Tarter would know better than most what it’s like, and knows that the answer will remain firmly stuck on “Yes” until she and others in the Search for Extraterrestrial Intelligence project (SETI) prove it otherwise. But the path she chose to get there was an unconventional as it was difficult, and holds lessons in the power of keeping you head down and plowing ahead, no matter what. To get to the point where she could begin to answer the fundamental question of the uniqueness of life, Jill had to pass a gauntlet of obstacles that by now are familiar features of the biography of many women in science and engineering. Born in 1944, Jill Cornell grew up in that postwar period of hope and optimism in the USA where anything seemed possible as long as one stayed within established boundaries. Girls were expected to do girl things, and boys did boy things. Thus, Jill, an only child whose father did traditional boy things like hunting and fixing things with her, found it completely natural to sign up for shop class when she reached high school age. She was surprised and disappointed to be turned down and told to enroll in “Home Economics” class like the other girls. She eventually made it to shop class, but faced similar obstacles when she wanted to take physics and calculus classes. Her guidance counselor couldn’t figure why a girl would need to take such classes, but Jill persisted and excelled enough to get accepted to Cornell, the university founded by her distant relation, Ezra Cornell. Jill applied for a scholarship available to Cornell family members; she was turned down because it was intended for male relatives only. Undeterred, Jill applied for and won a scholarship from Procter & Gamble for engineering, and entered the engineering program as the only woman in a class of 300. Jill used her unique position to her advantage; knowing that she couldn’t blend into the crowd like her male colleagues, she made sure her professors always knew who she was. Even still, Jill faced problems. Cornell was very protective of their students in those days, or at least the women; they were locked in their dorms at 10:00 each night. This stifled her ability to work on projects with the male students and caused teamwork problems later in her career. Despite these obstacles, Jill, by then married to physics student Bruce Tarter, finished her degree. But engineering had begun to bore her, so she changed fields to astrophysics for her post-graduate work and moved across the country to Berkeley. The early 70s were hugely inspirational times for anyone with an eye to the heavens, with the successes of the US space program and leaps in the technology available for studies the universe. In this environment, Jill figured she’d be a natural for the astronaut corps, but was denied due to her recent divorce. Disappointed, Jill was about to start a research job at NASA when X-ray astronomer Stu Boyer asked her to join a ragtag team assembled to search for signs of intelligent life in the universe. Lacking a budget, Boyer had scrounged an obsolete PDP-8 from Berkeley and knew that Jill was the only person who still knew how to program the machine. Jill’s natural tendency to fix and build things began to pay dividends, and she would work on nothing but SETI for the rest of her career. SETI efforts have been generally poorly funded over the years. Early projects were looked at derisively by some scientists as science fiction nonsense, and bureaucrats holding the purse strings rarely passed up an opportunity to score points with constituents by ridiculing efforts to talk to “little green men.” Jill was in the thick of the battles for funding, and SETI managed to survive. In 1984, Jill was one of the founding members of the SETI Institute, a private corporation created to continue SETI research for NASA as economically as possible. The SETI Institute kept searching the skies for the next decade, developing bigger and better technology to analyze data from thousands of frequencies at a time from radio telescopes around the world. But in 1993, the bureaucrats finally landed the fatal blow and removed SETI funding from NASA’s budget, saving taxpayers a paltry $10 million. Jill and the other scientists kept going, and within a year, the SETI Institute had raised millions in private funds, mostly from Silicon Valley entrepreneurs, to continue their work. The Institute’s Project Phoenix, of which Jill was Director until 1999, kept searching for signs of life out there until 2004, with no results. They proposed an ambitious project to improve the odds — an array of 350 radio telescopes dedicated to SETI work. Dubbed the Allen Telescope Array after its primary patron, Microsoft co-founder Paul Allen, the array has sadly never been completed. 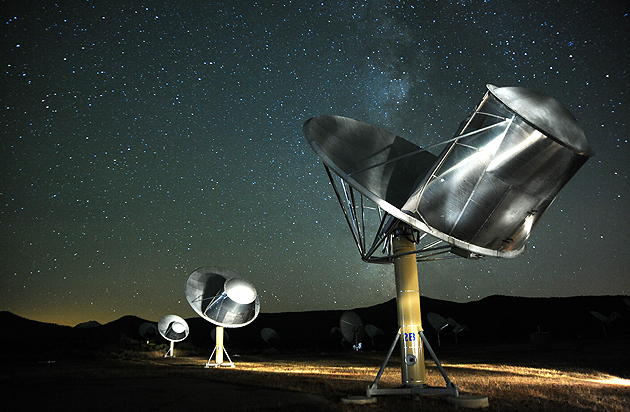 But the first 42 of the 6-meter dishes have been built, and the ATA continues to run SETI experiments every day. 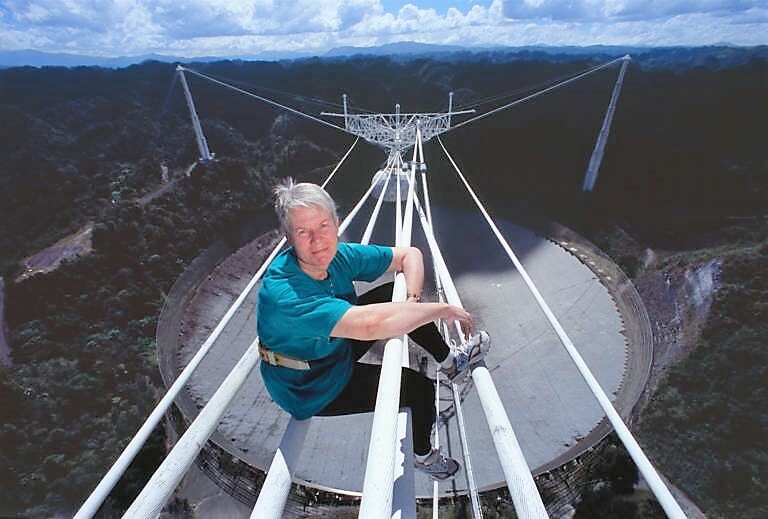 Jill Tarter retired as Director of SETI Research for the Institute in 2012, but remains active in the SETI field. Her primary focus now is fundraising, leveraging not only her years of contacts in the SETI community but also some of the star power she earned when it became known that she was the inspiration for the Ellie Arroway character in Carl Sagan’s novel Contact, played by Jodie Foster in the subsequent Hollywood film. Without a reasonable SETI program, the answer to “Are we alone?” will probably never be known. But if it is answered, it’ll be thanks in no small part to Jill Tarter and her stubborn refusal to stay within the bounds that were set for her. I recently had the opportunity to attend a lecture by Harvard Professor Paul Horowitz. It’s a name you likely recognize. He is best known for his iconic book the Art of Electronics which is often referred to not by its name but by the last names of the authors: “Horowitz and Hill”. Beyond that, what do you know about Paul Horowitz? Paul is an electrical engineer and physicist and Paul has spent much of his storied career learning and practicing electronics for the purpose of finding intelligent extra terrestrial life.